Melissa M. Reider-Demer1, D.N.P, MN, CNP and Dawn Eliashiv1, M.D. Background: Telemedicine enables providers to connect with patients and consultants remotely in a cost-effective, convenient manner. Telemedicine in various forms—from store-and-forward technology to real-time videoconferencing—has demonstrated good outcomes in specialties including neurosurgery, general neurology, stroke, and epilepsy. Aim: To demonstrate the feasibility of telemedicine in an outpatient university-based neurology clinic, and assess patient and provider satisfaction with telemedicine. Methods: Forty neurologically stable adult patients were recruited. We excluded patients who were non-English speaking, had intellectual disability, lacked caregiver availability, or had unstable neurological conditions. 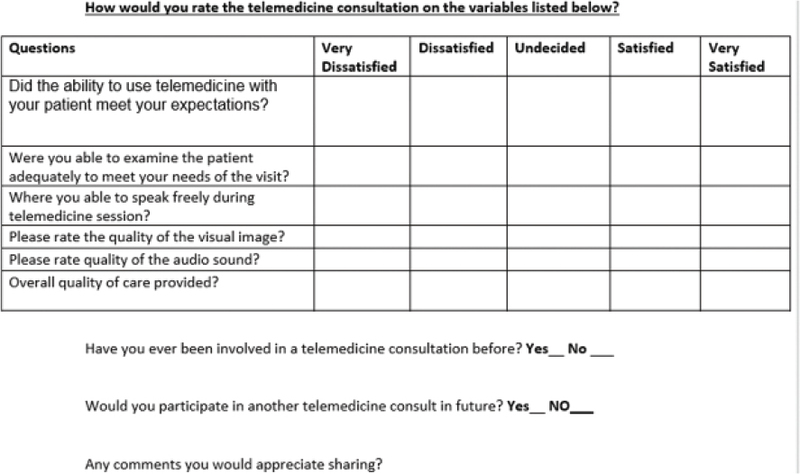 After each telemedicine visit a patient standardized satisfaction survey was completed, comprising 11 questions assessing patient willingness to participate, technical issues, and satisfaction with the clinic experience and medical provider. A provider satisfaction survey was obtained at the end of the study. Results: Forty of fifty patients meeting criteria consented to a telemedicine visit in lieu of a routine visit, and 15 of these responded to survey. All felt confident when meeting with their provider met their needs. Ninety percent of participants agreed that the technical process of joining the on-line session was easy. All patients agreed that they were satisfied with their telemedicine session and would choose telemedicine over face-to-face visits in the future. Cost analysis demonstrated a UCLA healthcare system saving of $28.00 for each telemedicine replacing an in-person clinic visit. Patients saved the cost of auto fuel, missed work, and parking when using the telemedicine option. Conclusions: Telemedicine in neurology patients is feasible and satisfies patients and providers. Traditional ways of providing health care are constantly being improved as evidenced by the increasing use of telemedicine. This option enables providers to connect with patients and consultants across challenging geographic distances in a cost-effective, convenient manner (Reider-Demer, 2017). In neurology and neurosurgery populations, telemedicine in various forms—from store-and-forward technology to real-time videoconferencing—has demonstrated good outcomes. (Reixeira-Poit, 2017). In an effort to maximize resource efficiency, continuity of care and patient access, the Veterans Health Administration has tested workflows using allied health professionals to conduct telemedicine follow-up care in lieu of in person clinical visits to maximize response efficiency and patient access (Dadlani, 2014). Further studies have shown that the use of telemedicine in neurology is an alternative to traditional health care (Hwa, 2013). In major urban centers, increased patient demands can cause neurology practices to struggle, resulting in patients having to travel within large catchment areas for follow-up care. This is especially true for subspecialty care where a significant shortage of neurologists limits the number of patients who can be seen (Reixeira-Poit, 2017). Many patients have to travel long distances, take days off work without pay, and absorb the costs of motor fuel and parking fees. Many have disabilities that hinder travel mobility, and many have restricted driving privileges, so travel to appointments places a burden on them and their caregivers. While the use of telemedicine may not be feasible for patients with complex neurological conditions, it is a viable alternative for stable patients (Pulley, 2015). Neurology visits are typically carried out face-to-face by trained allied health professionals, and have shown good patient satisfaction and high-quality care. We performed a prospective feasibility pilot study to determine if real-time videoconferencing (telemedicine sessions) with allied health professionals can successfully substitute for in-person clinic visits and still maintain patient/provider satisfaction in neurology (Govindarajan, 2017). The study was prospectively approved by our local institutional review board, and included random, stable neurology patients who accepted the use of telemedicine for their routine follow-up appointments, or results review sessions, among patients with ataxia, epilepsy, stroke, genetic disorders, dementia, multiple sclerosis, Parkinson’s disease and neuro rehabilitation. This project began in September 2017 and ended in December 2017. When established neurology patients required a follow-up clinic visit and/or a results review session, they were offered a telemedicine session as an option. Patients were required to have a stable neurology disorder, be over the age of 18 years, and be able to verbally consent to the study. Patients were offered this alternative provided they had internet access via a smart phone, tablet, or laptop equipped with a video camera, similar to that of the participating medical providers. Patients lacking one of these devices could not participate. Exclusion criteria were inability to speak the English language, inability to consent, or an unstable neurological condition. If the patient selected a telemedicine session, the clinic coordinators sent an invitation to the patient. To ensure that the telemedicine consult was feasible, a technology support designee contacted the patient prior to the visit and offered to test the internet connection and assist to download the application program “ZOOM.” The telemedicine consult was performed utilizing ZOOM, a secure web-based, HIPPA compliant software application (https://twitter.com/zoom_us). Verbal consent was obtained and documented within the clinic note at each clinic encounter with patients willing to participate in the telemedicine study. If the telemedicine visit resulted in an unexpected assessment, an in-person visit was arranged. Otherwise at the end of the session the patient was offered a future telemedicine follow up visit or a result summary session as appropriate. After each telemedicine session, patients were queried about their satisfaction with the telemedicine session via an automatically generated electronic patient satisfaction survey. At the end of the study the provider satisfaction survey was electronically sent to the participating providers. The patient survey instrument is provided as Survey 1(Figure 1), and the provider survey as Survey 2 (Figure 2). Outcome measures were used to evaluate patient/provider satisfaction and the feasibility of using telemedicine. Forty of 55 identified eligible patients accepted telemedicine sessions. Twenty-five participants used tablet computers, ten used laptop computers, and five used smartphones. All patient survey responders indicated that they wanted to participate in the patient satisfaction survey. All participants either agreed or strongly agreed that the telemedicine session was clearly explained to them. Ninety percent of the participants underwent a follow-up appointment. Ninety percent did not require a session prior to the actual clinic visit, and ninety percent agreed or strongly agreed that the technical process of joining the on-line session was easy. All participants either agreed or strongly agreed that they felt confident when meeting with the provider, could clearly visually see their provider on the device screen, and that the telemedicine session met their expectations. All patients agreed or strongly agreed that they were satisfied overall with their telemedicine session and would choose telemedicine over face-to-face visits in the future. Only one provider had previously used a form of telemedicine prior to this study. Among the nine participating providers, six responded to the questionnaire. All were satisfied that the telemedicine session met both their provider expectations as well as their medical needs for examining the patient, and were either satisfied or strongly satisfied with audio-visual quality. All were very satisfied with the overall quality of the care provided and would participate in telemedicine in the future. This prospective feasibility pilot study supports the effective use of videoconferencing by allied health professionals for established neurology follow-up clinic visits that may include a review of previously obtained tests. The clinical setting of this study supported using telemedicine as a tool in evaluating patients with follow-up clinic visits in a multi subspecialty outpatient neurology clinic with a varied diagnoses including epilepsy, genetic disorders, stroke, ataxia, dementia, neurorehabilitation, and other general neurology disorders. Telemedicine technology can bridge care gaps and help meet the increasing demands for neurologists. Twenty-one small studies within the United States were published between 2010 and 2015 and review telemedicine intervention outcomes for follow up care. These studies demonstrated showed a high level satisfaction in a majority of patients and providers who used telemedicine, and noted reductions in travel time and cost (Snyder, 2018). Telemedicine has proven to be an increasingly viable supplement to traditional health care delivery, enabling providers to connect with patients and consultants across distances in a cost effective and convenient manner (Armstrong, 2014). Telemedicine is an innovative tool for improving access to care reducing burden in clinics, and providing cost savings to patients, their families and the healthcare system. Telemedicine is convenient for patients who routinely use cellular phones, tablets, or laptop computers. Patients are willing and ready to utilize telemedicine as indicated by 40 out of 55 eligible patients opting to participate in this study. The post visit survey showed favorable patient and provider satisfaction. Telemedicine allowed patients to reduce driving time, fuel usage, and parking costs. Although total costs were not assessed, some specific cost savings were noted throughout the feasibility study. Typically, patients and families that drove to and from the medical center often missed work (Reider-Demer, 2017). Costs for fuel in the state of California averaged $0.54/mile. Parking at our institute was $12.00 daily. As this was a pilot study a health economics analysis including administrative, pre and post visit functions were not assessed. Note, telemedicine visits did not incur clerical cost for registering patients or medical assistant costs to obtain vital signs which saved the department $28.00 per visit in our department. The reduction in clinic load would allow to schedule more patients as well as decrease wait time for new or established clinic visits, decompressing clinics. The use of telemedicine, employing technological devices such as cellular phones, tablets and laptops, can improve access to healthcare providers. It can provide medical care providers an equivalent alternative to in-person clinic visits, ultimately providing better service to patients and their families. As hospitals acquire electronic health-record systems, wireless telephones, and other technological devices, telemedicine will likely become an integral part of the institutional infrastructure. The limitations of this study are the relatively small number of patients, the lack of access for patient without acceptable devices, lack of internet connection in some households, and language barriers. As this as a pilot study the applicability of telemedicine to unstable patients was not assessed. Presently the use of telemedicine can only be used within the state in which a practitioner is licensed to practice. Additionally, Medicare does not reimburse for telemedicine. Both are limiting factors that could be surmounted in the future. Telemedicine is an increasingly viable, cost-effective, convenient alternative to traditional neurological care delivery, enabling providers to connect with patients and consultants across distances (Reider-Demer, 2017). This pilot study supports telemedicine as an option for neurological patients with favorable patient/provider satisfaction. Further studies should be performed in additional patient populations at other institutions. Armstrong K, Semple J, Covie P. Replacing ambulatory surgical follow-up visits with mobile app home monitoring: Modeling cost-effective scenarios. Journal Medical Internet Research 2014:16(9):213. Dadlani R, Mani, Subramanyan M, Ganesh J, Mohan D, Rajgopalan N. The impact of telemedicine in the post-operative care of the neurosurgery patient in an outpatient clinic: A unique perspective of this valuable resource in the developing world—an experience of more than 3000 teleconsultations. World Neurosurgical. 2014;82(3):270–283. Eisenberg D, Hwa K, Wren SM. Telephone follow-up by a midlevel provider after laparoscopic inguinal hernia repair instead of face-to-face clinic visit. Journal Society Laparoendscopic Surgeons. 2015;19(1):e2014.00205. Govindarajan R, Anderson E, Hesselrock R, Madhayan R, Moo L, Mowzoon N. et al. Developing an outline for teleneurology curriculum. Neurology. 2017;89:951–959. Hwa K., Wren, SM. Telehealth follow up in lieu of post-operative clinic visit for ambulatory surgery: Results of a pilot program. JAMA Surgery. 2013;148(9):823–827. Pulley M, Berger A, Hodges W, Brittain R, Feasibility study of the use of telemedicine in the care of ALS patients. Neurology. 2015;84:127. Reider-Demer, M., Raja, D., Martin, N., Schwinger, M., Babayan, D. Prospective and retrospective study of videoconference telemedicine follow up after elective neurosurgery: Results of a pilot program, Neurosurgical Review. 2017; April 4(2). 497–501. Snyder S, Editorial: Telemedicine for elective neurosurgical routine follow up care: A promising patient-centered and cost effective alternative to in-person clinic visits. Neurosurgical Focus. May 2018;44:5:18.